Patton Ann Lynch winning the Run For the Bling in San Antonio October 2016! Patton Ann Lynch qualifying for the American Semi-Finals 2016! "Stache" was raised by Shady Oaks Farms and sold to Craig Brooks were she was a top futurity contender in 2011 with earnings over $30,000. We are super excited that Kyra Stierwalt has purchased Stache and they are off to a great start! Kyra and Stache winning Pretty Prairie, Kansas! Bonnie and Super are having a great futurity year! They placed at all the Arizona Futurities. At The Jud Little Futurity, they ended up 3rd in the amateur average and 20th overall out of a really tough field of horses. Congratulations to DeAnne and Tex on running a 21.004 in the poles. Tex is a 5 year old that had never been entered in the poles before. Mesa was bred by Shady Oaks Farms and trained by the Milligans! Madison and Brother Kreese are two great talents! This mare is as nice in the roping pen as she is in the barrel pen! Ireland is owned by Caylee Graves and she entered him in a couple 2013 futurities. He is a Frenchmans Chico gelding raised by Shady Oaks Farms. Best of Luck Caylee! Ireland and Caylee winning the 1D Novice at Cooks Arena! Congratulations to Kirsten Parker and Tiny Bit French! 2013 NIRA Southern Region Top 15 in the barrels! 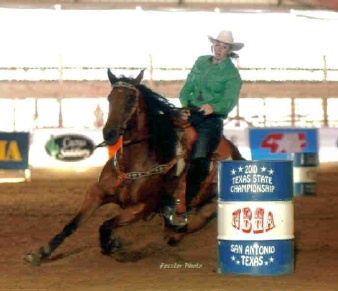 Money earner at NBHA Texas State Finals, Cowboy Capital, etc. with limited hauling!